The Spiral Wound Gaskets are composed of metallic continuous stripe with a special shaped profile, coupled with a continuous filling stripe (Asbestos, PTFE, Grafoil, Ceramic etc.,) evenly wound in concentric spiral under constant stress. The Spiral Wound Gaskets are reinforced on the inner and outer diameter by winding of several electrically welded spiral metal only. The main property of Spiral Wound Gasket, owing to elastic action of the special metallic stripe profile, is that of offering a perfect sealing under all fluctuating pressure and temperature conditions, also where temperature excursion has considerable value, maintaining tightening elastic recovering. This elasticity can be modified by a proper selection of components, and they can be installed even with flanges at standard working with lightly pitted or buckled by the use of flanges. 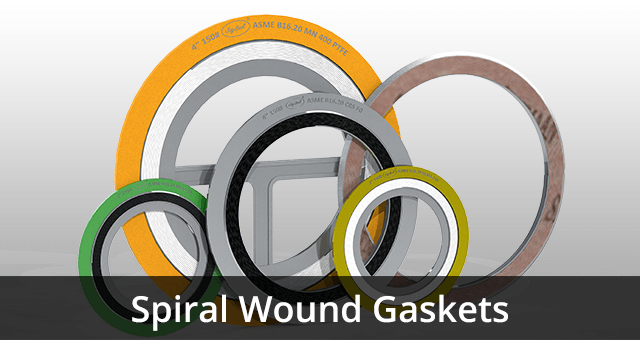 A proper selection of materials (both metal and fillers) allows the spiral gasket to be adequate to the most various operating conditions. The normal shape is circular but it is possible to make oval shape, oblong shape. They can also be combined with jacketed gaskets to tightening heat exchangers internal shapes. Spiral gaskets are made as per ASME B 16.20 to suit ASME B 16.5 flanges and as per “A” Series to suit ASME B 16.47 flanges. We also make spiral as per DIN 2632-2638, IS STDs.